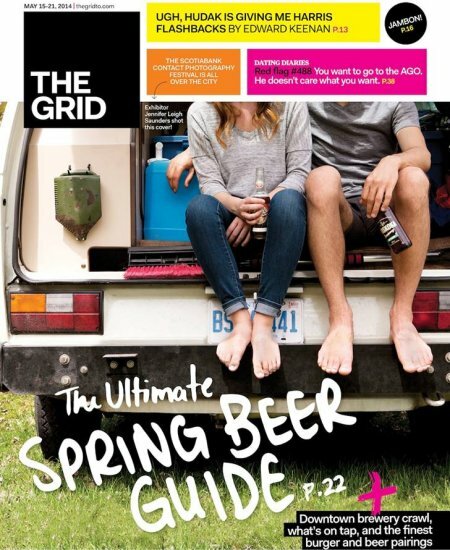 TORONTO, ON – Proving once again that it may be the most beer-friendly print publication in Toronto, this week’s issue of Toronto arts and culture weekly The Grid features an extensive Spring 2014 Beer Guide as its cover story. The bulk of the section is taken up by the Ultimate Victoria Day Two-Four, featuring reviews by beer columnist Crystal Luxmore of two dozen local, national and international beers that are suited to the mild temperatures of spring and early summer. Also included are a number of sidebar articles including: a round-up of four upcoming beer events that are worth checking out; recommended beer and burger pairings at six local bars and restaurants; a look at four draught-only beers that are also great for spring; and a tip sheet for a Toronto brewery crawl. All stories can be read online using the links above, and the paper edition of The Grid is available for free at many locations in and around Toronto.